The best water filter for any situation will depend on factors such as cost, effectiveness, and materials available, as well as the required filter effectiveness. We'll look briefly at the qualities and characteristics of the following filter types: This may help in determining the best water filter for a given situation. How Does a Cloth Filter Work? A clean piece of cloth can be used to strain sand, silt, clay and some pathogens out of water. You can use any cotton cloth that is fine and tightly woven, such as a sari cloth. The cloth should be folded into a few layers and tied over a clean container. Afterwards, you should wash the cloth with clean water before using it again. A biosand filter is a concrete or plastic box that is filled with layers of sand and gravel. Water is simply poured into the top of the filter and collected in a safe storage container. Pathogens and turbidity are removed by physical and biological processes in the filter sand. A biosand filter may be the best water filter in places where the materials for construction are available. How Does a Kanchan Arsenic Filter Work? The Kanchan Arsenic Filter is an adaption of the biosand filter. It is a concrete or plastic box that is filled with layers of sand and gravel. There is also a layer of rusty nails. The iron oxide in the nails make the best water filter for removing arsenic. Brick chips are used on top of the nails to keep them from moving around. Pathogens and turbidity are removed by physical and biological processes in the filter sand. Water is simply poured into the top of the filter and collected in a safe storage container. How Does a Ceramic Pot Filter Work? Ceramic pot filters are usually made from clay mixed with a combustible material like sawdust, rice husks or coffee husks. Colloidal silver is sometimes used to help with pathogen removal. 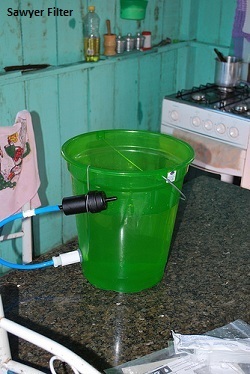 A ceramic pot filter may me the best water filter where materials for biosand filters are not available. Water is poured into a ceramic pot, and is collected in another container that has a tap at the bottom. This system also provides safe storage until it the water is used. How Does a Ceramic Cartridge/Candle Filter Work? Ceramic cartridge or ceramic candle filters are hollow cylinders that are usually made from clay mixed with a combustible material like sawdust, rice husks or coffee husks. A ceramic cartridge/candle fiter may me the best water filter where materials for biosand filters are not available. Colloidal silver is sometimes used to help with pathogen removal. One or more candles are attached into the bottom of a container. 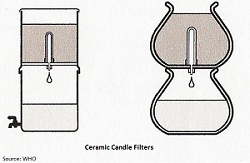 Water is poured into the container and flows through the cartridge or candle, and, in the case of a candle filter, is collected in another container that has a tap at the bottom. How Does a Hollow Fiber Membrane (dialysis technology) Filter Work? kidney dialysis, these water filters use a collection of “hollow fiber membranes”. The filters are comprised of tiny "U" shaped micro tubes that allow water to enter into their core through tiny micro pores. The pores are so small (0.1 micron) that no bacteria, protozoa, or cysts like E.Coli, Cholera and Typhoid can get through. Water is poured into a container, such as a bucket and flows through a tube to the filter. Once the water passes through the hollow fiber membranes, it is collected in another container for safe storage. * Quantity: Can filter up to 1 liter of water per minute. These may be the best water filter in terms of flow rate. As you can see, there is no one best water filter. A careful assessment of the needs and resources of a specific locale and circumstance will be required in order to determine the approach that is most appropriate. Return to "Water Treatment" from "Best Water Filter"